Vacations are rare moments that come to us not so frequently. When taking vacations, our main aim is to enjoy that time to the fullest and kept the memories with us both in our minds, hearts and also physically. 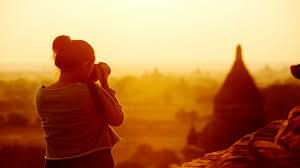 Taking photos when in vacation with your loved ones is the best part since it will help you remember the good times you had. The photos have to be just perfect so as to capture our moments to the fullest. Here are tips on how to take great vacation photos. Firstly, get a good camera bag, enough full batteries just in case lights go out if you had a chargeable camera. Have enough extra storage so you won’t have to delete photos to make space for others. Also, be adventurous; go out of the ordinary paths to find rusty places or even beautiful sceneries. Taking good shots of even rusty places makes them look beautiful and unique. For amazing photos, you need wide angle lens. These will help in capturing all the beauty of the scenery. 10-22mm would be really great for you, but if this wasn’t in your budget, a 32mm prime would also do the job. If you didn’t carry your wide angle lenses, you can use panoramic sequences then be able to pair the pictures together later by the help of Photoshop. You can also use light to your advantage. Taking pictures in the morning and evening hours is the best time since there are fewer shadows and the light is richer. Even when there isn’t a perfect weather and it’s raining, you can still use the light to your advantage. Look at things that glisten and reflect well the image, focus on the light even the smallest amount and you’ll have a great picture. Any weather is a great time to take a photo; whether in scarves, umbrellas boots, and others, just go with what you have and you’ll make a great picture. Concentrate on the faces. Having a great moment includes seeing the joy in your loved one’s eyes. Capturing a great moment will have you crying in joy years later as you look at expressions on your loved one’s eyes. To do so make sure you’re good at your focusing technique then open widely the apertures of your camera (this will make the background blur ry and highlight the face) then zoom in the face concentrating on the eyes or eyelashes and with that, a great shot will be taken.